The Speedaire 3z406 compressors are decades old now and are no longer supported by Speedaire / Grainger. The Speedaire 3Z406 compressor has a horizontal tank about 30 gallons in size, two wheels at the rear, and a handle to drag it along, making this a portable compressor. It came with a 1 HP 120 VAC motor. This model was built back when a 1 HP motor on a decently pump could be relied on to last a long time and deliver a respectable amount of compressed air. 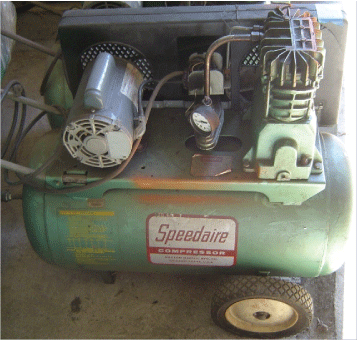 I suspect there are lots of these Speedaire compressors still in use and being of the 1970’s vintage, this compressor was probably built a lot better than similarly sized air compressors are today. It looks “real”. Given that it’s long out of date, owners may be having a bit of an issue getting information and help with this model. Are you one of those? Do you have a problem with your model 3Z406? Use this page to ask your fellow 3Z406 users a question. Are you an owner and user of the Speedaire 3Z406 that has solved a problem or two? If so, please share that information with other users, won’t you. If you have a manual of this compressor in digital form, even if it’s just a bunch of photos of the original pasted into a document, please upload it via the form below.